The LE of the AllroundAir’s name stands for ‘Light Edition’ and to quote the brand, it is “light weight, light design and light on your pocket!” The range is comprised of two board sizes (10’2” and 11”0”) yet only the larger of the two is available as a WindSUP option in 2016. At 6” deep the AllroundAir sits high on the water’s surface, its length providing directional stability, whilst its ample width making it easy and practical to get on with. Used as a SUP, it glides efficiently and is a very comfortable board for cruising over great distances on, feeling corky yet responsive. One noticeable advantage of the LE’s construction and dimensions is that it provides excellent stiffness even at low pressures (a 75kg adult can get away with as little as 10PSI), making it practical for a quick ‘pump and ride’ session. In light winds and with the central fin in place, it becomes a family’s multi-discipline windsurfer, from the beginner’s first platform to the experienced rider’s throw-around freestyle toy. Its upwind capabilities won’t set your hair alight, yet the central fin does its job fine, mitigating any sideways drift. As the wind increases, another real advantage of the LE’s lightweight becomes immediately apparent – being so light (and with its high floaty stance on the water) the board accelerates quickly and efficiently as power is applied. It is not as efficient as others once planing … and its 6” thickness means it is hard to keep the rails engaged and board planted (the LE easily getting buffeted off-course by chop), yet as a tutor for that initial planing experience, the JP is a lot of fun. 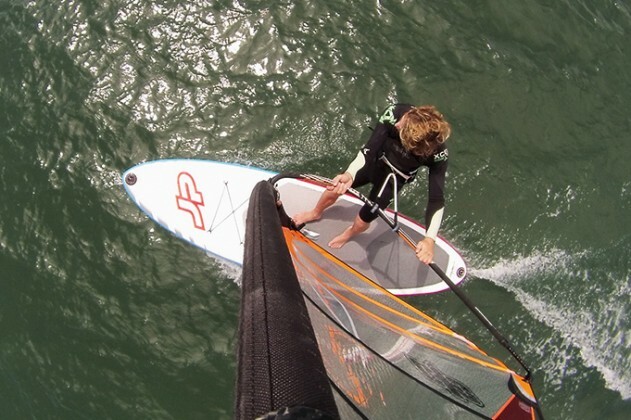 Its construction demands diligence, so the JP is more suited for private ownership rather than windsurf-school abuse, yet at £300 less than some of the other inflatable boards here, it is not an option to be sniffed at.